Amoebiasis (Intestinal and hepatic), Giardiasis, Trichomoniasis, Bacterial vaginosis, Treatment of susceptible anaerobic infections. Amoebiasis : Adults: 500 mg twice a day for 5 days. Amoebic dysentery: Adults: 1.5 gm once a day for 3 days. Giardiasis: Adults: 1.5 gm once daily for 1-2 days. Trichomoniasis : 1.5 gm once or 500 mg twice a day for 5 days. Sexual partner should also be treated at the same time. Bacterial vaginosis: 3 tablets of 500 mg each as a single dose or one tablet of 500 mg once daily for 5-7 days. 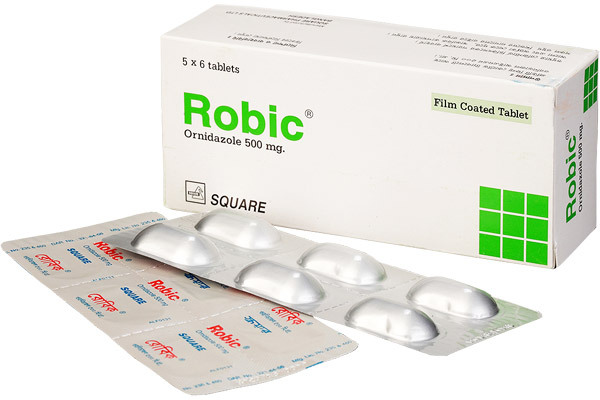 Robic® Tablet: Box containing 5 x 6 tablets in blister pack.